Why Are Experts Worried About Our Children's Oral Health? A third of children are leaving primary school obese or overweight, according to Public Health England, which is urging parents to help their children give the sugary snacks a miss and replace them with healthier alternatives. It’s guidance we can definitely get behind here at AP Smilecare – we’re all for healthier teeth, at all ages! On this week’s blog, we’re taking a quick glance at exactly why officials are concerned, and what we can all do to improve the situation. There are a number of slightly scary statistics that have prompted these latest calls, in addition to the one we started with just above! A quarter of children suffer from tooth decay by the time they turn five, and experts say that the average schoolchild has at least three sugary snacks a day. The majority of these are biscuits, while sugary juice drinks and cakes, buns and pastries also come in high on the list. And that’s all just one child! All this means that the typical diet contains three times more sugar than the recommended amount, and as you can imagine, these unhealthy snacks and drinks are largely to blame! Luckily, Public Health England are putting forward some initiatives, and there are still actions we can all take at home, too. What’s Being Done To Help Children’s Dental Health? PHE is leading a drive to encourage healthier snacking, which includes displays at supermarkets that highlight special deals and discounts on fruit and vegetables. Meanwhile, the Department of Health is using its Change4Life public health programme to make it easier for parents and kids to make the switch. The Change4Life website will allow users to get vouchers for money off towards snacks like malt loaf, low-sugar fromage frais, and drinks with no added sugar. In the meantime, they’re advising that children have snacks with no more than 100 calories, and two a day at the absolute maximum. No word yet on what Britain’s youngest generation think about the idea! All joking aside, of course there’s always going to be resistance to introducing healthier snacks at the cost of sugary ones. But like almost everything else, instilling these in children’s mindsets early on can make all the difference to better oral habits later on in life. 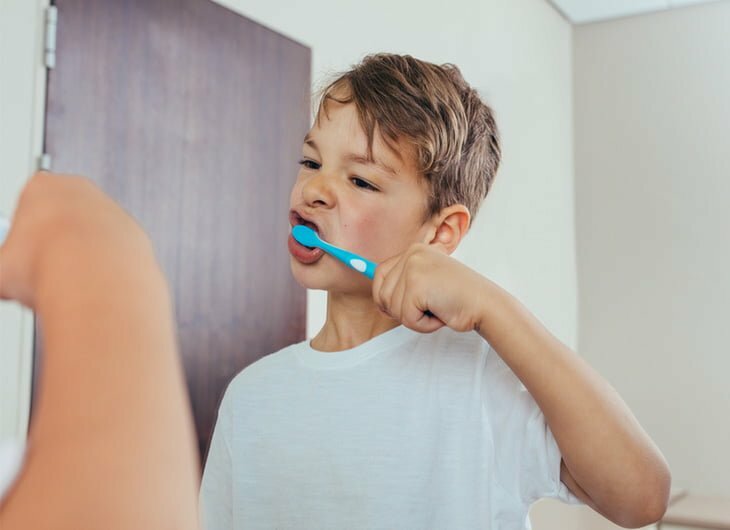 We’ve gone into detail before on a couple of ways that parents can make things easier for themselves – one of the most useful ones is to make teeth-brushing fun! For younger children, having a timer toy (like a small train circling a track) can make the two-minute time limit seem to run down faster than you can say “better dental health”, while for older children, experts advise setting them the challenge for brushing for the duration of a two or three-minute song – preferably one of their favourites.